Your alarm goes off and it is time to start your day. Many of us start the day thinking about what to wear, why did we get out of bed, all the errands we have to run, and hoping to have enough time to enjoy a shower. However, I would be willing to bet for the majority of humanity, we start with the morning with a hot cup of coffee. It is the the fuel that feeds our busy lives from morning until night.You want to know what I think about when I think about coffee? I think about dinner. That’s right, dinner. It is no secret that coffee can be used in a number of ways when it comes to all things edible. Coffee can be used for every square of your day in all kinds of ways. 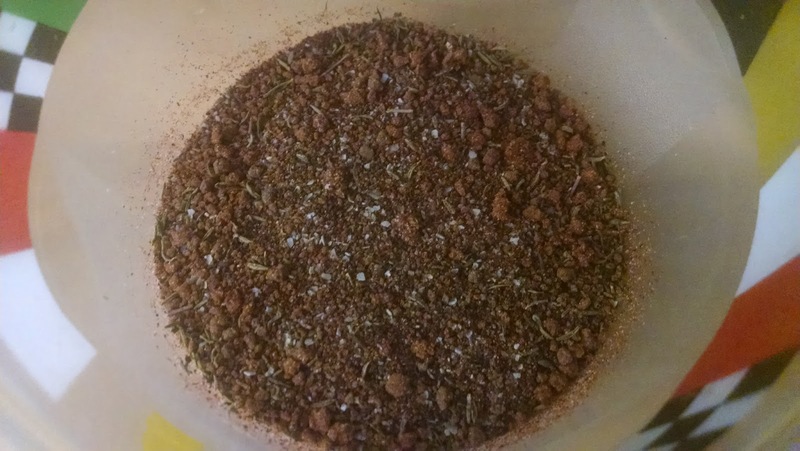 My favorite way to use coffee, besides drinking it, is to add another level of earthy richness to a dry rub for fish, pork, chicken, steak, and vegetables. Yes, it will work on any of those things and provide wonderful body to any dish you are making. We have talked about dry rubs before on this blog, but I just wanted to give you a fresh take on what you could do if you were feeling inspired. Besides, inspiration is often the best time to be in the kitchen. So, always take those opportunities if you have them. So, what could you put in your multipurpose coffee rub? Well, perhaps this will give you a few ideas. 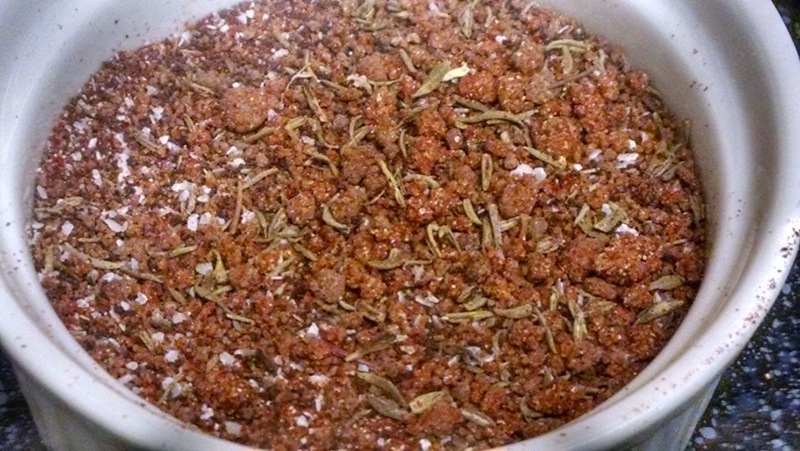 Salt, fresh ground pepper, dried thyme, paprika, coffee grounds, onion powder, garlic powder, brown sugar, chili powder. That is it! Mix it up and you are done! In this photo notice that I haven’t gotten all the coffee incorporated, otherwise it would look like this. That is all that it takes. I do have a few little lumps from the brown sugar, but don’t worry because that will break up by the time you have finished the dish. 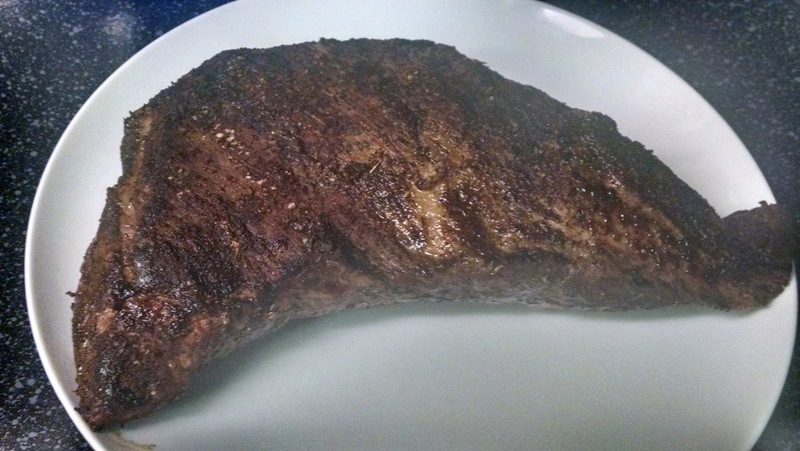 Here is an example of how you could use it on some tri-tip that I barbecued the other night. Yes, it gives that beautiful dark color and a very unique flavor. Just be careful because this combo with the coffee, brown sugar, and paprika can turn dark very quick. Just make sure you are keeping an eye on it! Note: Make sure to taste and adjust as needed often. You may find you want more garlic, less spice or want to make some other adjustments. This is just a base recipe for what I like to use in my coffee rub. If you are unsure about the amounts, try cutting the recipe in half or omitting what you don’t want until you are sure about what flavors work for you. Mix all ingredients until combined. Transfer to container of your choice and use as desired. Still want to do more? Don’t let me stop you, just add a pinch to your chili or your favorite ice cream.